The 11th Osamu Tezuka Cultural Award Ceremony was held on June 6th. During the award ceremony, each winning mangaka talked about their thoughts, feelings and future plans. In Japan, the Tezuka Osamu Cultural Award has become one of the most prestigious manga award in the industry. 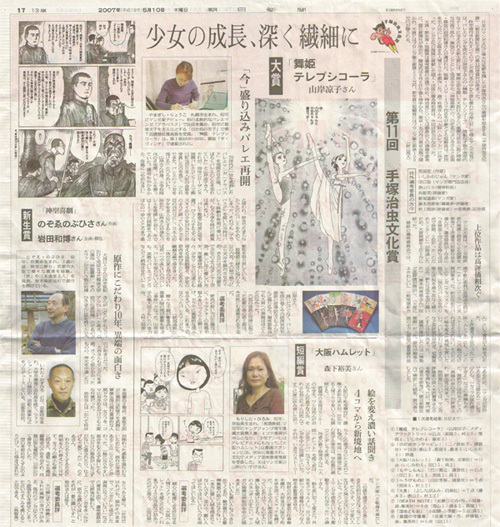 The Tezuka Osamu Cultural Award is one of the most prestigious manga award in Japan. 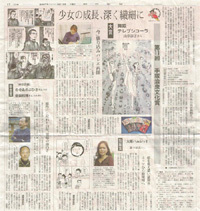 The award, named after Osamu Tezuka, was established by Asahi Shimbun in 1997. The Tezuka Cultural Award should not to be confused with Shueisha's Tezuka Award, which was created in 1971 (Weekly Shonen Jump, or the anime/manga Osamu Tezuka Award created by AnimeEast in 1995. In the beginning there were two categories, the Grand Prize and the Award for Excellence. An additional Special Award is given out to a person or group who have contributed to the development of manga. Nominations are picked by general manga readers and industry professionals, from which the finalists are selected by a panel of judges made up of manga artists, writers, critics, and others from the field. In the final stage of the selection, each judge will vote with a total of 15 points, with 5 points per work at a maximum. The title that receives the most point is awarded the grand prize. In 2003, two new categories, the Shinsei (New Hope) Award and the Short Story Award, were added. 3 other awards are also handed out: Shinsei (New Hope) Award, the Short Manga Prize and a Special Award. The winner of the Grand Prize receives 2 million yen and a bronze statue, while winners of the other categories receive 1 million yen and a bronze statue. Special Award: Minoru Naiki for the establishment and management of the Gendai Manga Toshokan (Modern Manga Library). Special Award: Shotaro Ishinomori for the years of contribution to both manga and the manga industry. - Special Award: Fusanosuke Natsume for his contributions to manga criticism. Special Award: Frederik L. Schodt for the promotion of Japanese manga around the world. Special Award: Akira Maruyuma for the support of manga artists at Tokiwa-so. Special Award: Shigeru Mizuki for his creativity and years of activities. Special Award: Taro Minamoto for pioneering historical manga and contributing to manga culture. Special Award: Kawasaki City Museum for its exhibitions and collections of manga from the Edo period to present. Special Award: Kousei Ono for many years of introducing foreign comics to Japan and activity as a commentator. During the award ceremony for the 11th Tezuka Cultural Award, the grand prize winner Ryoko Yamagishi said, "Thanks to Mr. Tezuka, manga spread around the world. I'm both proud and glad to be able to receive this prize." She also discussed her determination for the second season of Maihime Terpsichore: "I want to change the intensity of drawing manga into something that is amusing and full of surprise." The Shinsei award winner, Nobuhisa Nozoe and Kazuhiro Iwata, took the platform together. Nozoe said, "I want the spirit of Kyojin Onishi (the original writer) to last forever." Iwata said, "I think I was able to receive this award due to a kind of alarm during fragile times. Please read our work, everyone." The short manga award winner Hiromi Morishita said emotionally: "An acquaintance in my hometown mentioned in a letter about Mr. Tezuka that 'Mr. Tezuka is the king of manga.' She said king instead of god. I think the life of a mangaka is to become the God of manga."